In late October the largest Atlantic hurricane on record slammed into the Caribbean and North America. By the time the aptly-nicknamed “Superstorm Sandy” had run its course, it had left a path of devastation that included extensive flooding, widespread power outages, nearly 300 fatalities, and over 75 billion in property damage. Among the areas in the path of the storm were large parts of New England, the mid-Atlantic and Central Canada – areas where Symposium has a lot of clients. At that time, we had recently launched our EMLive web-based incident management system, which enables departments to securely distribute incident data to first responder smart phones and tablets in real time. By the time Sandy came ashore many departments throughout the affected area had already deployed the application, and it had been brought to the attention of people in the Massachusetts Emergency Response Center that EMLive would be a great way to help track the situational status of these departments during the storm. 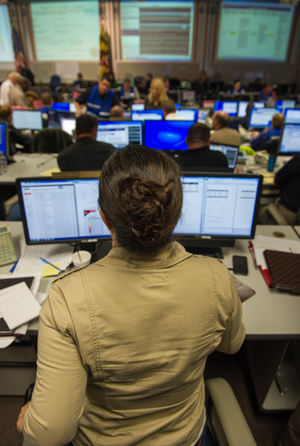 Access to EMLive was set up directly in the command center, and personnel were able to track incident response in real time for departments throughout the state, providing high-level situational awareness at a time when coordinated decision-making was crucial. Over the course of the night, the volume of incidents being pushed through EMLive was so high that Symposium staff monitoring the system increased the bandwidth available at the server center several times in order to maintain the highest levels of availability. The result was that the system performed flawlessly, and played an important role in helping personnel respond faster, safer, and more effectively during a situation when resources were stretched to their limit. Since Sandy EMLive has been deployed even wider, with over a hundred departments now using the system to keep first responders and management in the loop about developing situations. And now, with RMS integration delivering pre-fire plan info directly into EMLive, agencies are even better situated to put access to crucial time-sensitive incident information in the right hands, when and where it’ll make the most difference. To find out more about how EMLive can help your department, visit the EMLive website or contact us at info@symposiumtechnologies.com.